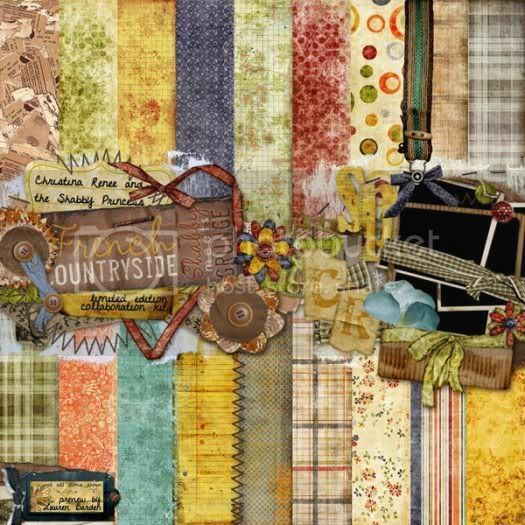 Just loved this FRENCH COUNTRYSIDE Mega kit by Christina Renee... i could not resist this so i bought it last night at $6.27 (that is already 30% off) and while writing this post i am actually downloading the 3rd part of the kit after buying it.. Yay i bought again.. stop me stop me!! the Kit is whooping 450 MB of files. It contains over 20 papers and 50 elements. The papers are shabby and grungy as well. I can't wait to use this kit. I bought it bec. it is a limited edition and was on sale 30% off. The kit looks like this... isn't this gorgeous??? But help me STOP from shopping again it's getting addicting you know. If i finish a layout i will definitely share them with you.